As as independent Catholic college, Lourdes Hill College provides education for more than 1281 girls from Year 7 to 12. The school strives to enable their students to be flexible thinkers and life long learners who will succeed in the information and knowledge age. Lourdes Hill girls are challenged to construct knowledge using disciplined inquiry to explore issues that have value beyond the classroom. Lourdes Hill College approach to education draws on the insights and practices of Benedictine spirituality and the story of the Good Samaritan, emphasising the values that support holistic living. Students are encouraged to live out the practical Benedictine values of genuine community, compassion effective listening and moral stability. Students are taught core thinking skills to enable them to balance the spiritual, emotional, intellectual and practical dimensions of their being. Lourdes Hill College helps their girls becoming critical, creative and reflective thinkers and provide the tools they need to apply these positive thinking skills in their learning, at home and in the community. Senior School students are provided with a diverse range of opportunities to experience real and authentic learning that connects them with their future after school. A wider range of academic subjects are offered, as we all vocational education and training opportunities, including traineeships. The college also offers preparation for university entrance, one-on-one mentoring programs to enhance academic outcomes, career counselling and VET courses including traineeships. 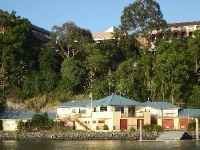 Lourdes Hill College is conveniently located six kilometres from Brisbane's central business district and has ready access to bus, train and CityCat services. Morningside train station is an easy 10 minute walk from the College and Hawthorne CityCat terminal is a short five minute walk from the College. Outdoor tennis courts which encourages students to practice and provides an on campus facility for coaching. The College sports program focuses on the physical, emotional, intellectual and spiritual development of our students and maximises participation with the intent to encourage a healthy lifestyle and a life long enjoyment of sport. "As an international student I have to say that Lourdes Hill College is like a big family to me, because I receive so much extra care and help from the teachers and students... I have made many Australian and international friends from school and we enjoy learning and knowing each other’s cultures. I am in Year 12 now, and I am so glad that I am doing the subjects that I really like. Everyone around me is very hard working because we care about our future and so do the teachers. I would like to encourage more and more international students to come to Lourdes Hill College, to be one of us. I believe everyone at Lourdes Hill College will become the best that we can be."